Razer have been making great mice for quite a while now, in fact the first gaming mouse I ever owned was a Razer Diamondback. Up until that point I’d just been using whatever mouse came with the computer which was usually never good quality. That mouse was a solid performer for close to 4 years before the fire button stopped working, which is a long long time for a dedicated Quakelive player. Today though the focus is on the Razer DeathAdder Chroma, a mouse released by Razer in 2014 which was basically an update to the DeathAdder 2013 4g with the 6400dpi Avago ADNS s3988 sensor. 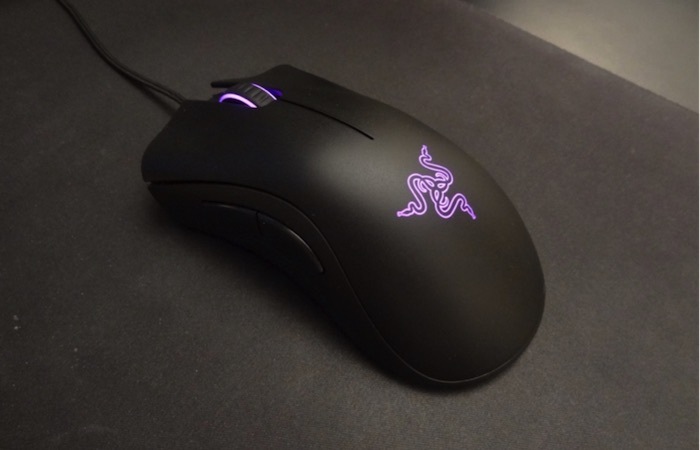 We should get one thing out of the way right now, the DeathAdder Chroma (and all other Deathadders) is not a small mouse. If you utilise a claw grip, then this mouse may not be the one for you, as it is quite large and heavy (comparatively) which will hamper the easy with which you can move the mouse with your fingertips. That said, the coating is non slip and the textured rubber on the sides provides quite a firm hold once you wear it in and it warms up a bit. The second thing is that if you already own a DA 2013 4G, then the Chroma is almost identical, even utilising the same sensor (albeit at 10kdpi interpolated). So this is probably not much of an upgrade for those who already have a 4g DA, but anything below that and you are definitely looking at a big upgrade in performance and tech. With those two points aside, let’s talk about the mouse itself. The biggest feature of this mouse is definitely the sensor, which is absolutely flawless. There is zero positive or negative acceleration at any dpi and it managed to track accurately at any speed. The tracking is absolutely perfect. The feet are frictionless on the QCK+ used for testing, and movement was smooth despite the weight of the mouse. The texture of the mouse is slightly smoother than the earlier DA 2013 4G, which does aid in gripping the mouse a bit better. The textured rubber from the side does work well to aid in gripping the mouse as soon as it has been worn in a bit. At first it will seem slightly slippery to touch, but that does not last long. It might even just be a protective coating for storage wearing off with use. The action of the buttons is short and crisp with two side buttons on the left side of the mouse, which are in a good spot to be used conveniently. The mouse wheel turns smoothly, the one negative is that there is some lateral jiggle on the mouse wheel. Ergonomic design for right handers so if you’re left handed this mouse will definitely feel quite awkward in your hand. Gameplay wise the mouse feels good to hold, and if you’re using a palm grip it plays well for long periods of time without any feeling of fatigue. Claw grip however you will find your fingers fatigue reasonably quickly, mostly due to the weight and the position you will have to grip the mouse at.